Jim McNerney is smart about motivating people; crafting business strategies that spark profitable growth; and making operations more productive, efficient and effective. Most important, he is a genius at creating harmony within communities. He wins hearts and minds with a clear vision of the future, combined with personal humility. 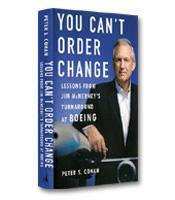 Learn how these skills help him pull off the seemingly impossible turnaround of Boeing. How to unlock individual achievement in each employee, and identify and develop leaders. How to set goals and implement strategies that help groups work together for the greater corporate good. Why you should link pay to profit and process rather than stock price. How to engage engineers so they are motivated to meet the needs of customers. Why organic growth is better than growth by acquisition. How to create a culture of ethics and compliance.